Lt. Gov. Dan Patrick marked the halfway point of the special session Tuesday by calling for "better communications" with the House, which has moved much slower on Gov. Greg Abbott's agenda than Patrick's Senate has. *Editor's note: This story has been updated to reflect a statement from Joe Straus' office. "Like you would do in any business, you'd sit down with the three leaders and have a plan, but we have no communication with the House," Patrick said in an interview with a conservative group, suggesting House Speaker Joe Straus, R-San Antonio, has repeatedly rebuffed his requests to sit down together and game out the special session. "We have to have someone we can communicate with." "I've not had one meeting with the speaker of the House in nine months, face to face, on policy," Patrick added, noting that for himself and Abbott, "it's hard to predict what's going to happen or work out in a seamless way to do the people's business if no one will sit down and talk with us. So the special session is really left up to the governor and I to try to direct it." 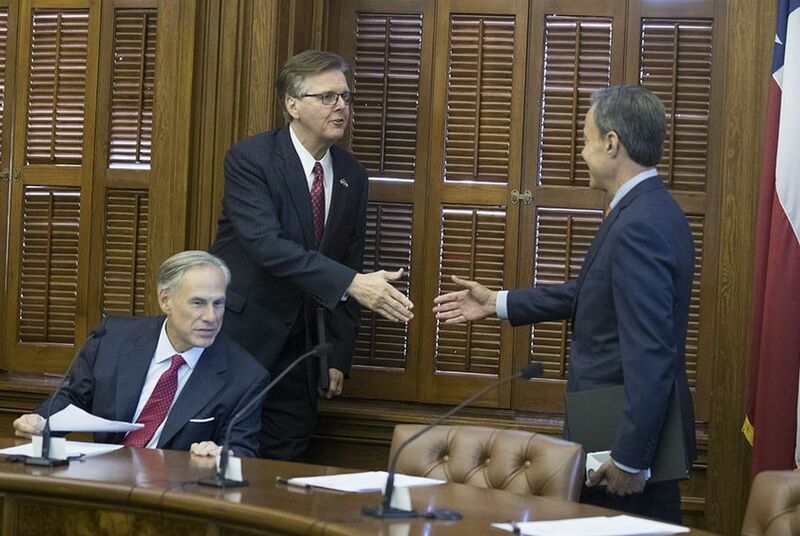 The Big Three — Abbott, Patrick and Straus — regularly shared breakfast together on Wednesdays during the first half of the regular session. But those breakfasts came to an end during the second half as tensions between the House and Senate intensified, leading to a legislative standoff that sparked the current overtime round. "The Speaker is more than willing to meet with the Lieutenant Governor and has always expected that they would talk at the appropriate time during the special session," Straus spokesman Jason Embry said in a statement. "The Speaker's door is always open." Patrick's remarks Tuesday came during an interview on Facebook Live with Michael Quinn Sullivan, the president of the influential conservative group Empower Texans. Patrick's tone Tuesday was somewhat more conciliatory than at the end of the regular session and the start of the special session, when he accused of Straus of laying the groundwork for a state income tax with his school finance plan, a claim the speaker has called "laughable." Patrick has also taken aim at Straus aides, saying in one instance that the speaker's chief of staff is a Democrat despite scant evidence to back it up. "My door is open," Patrick said Tuesday. "The speaker has my phone number. He knows where I am most of the time. I don't care about our differences. I don't care anything that's been said in the past. I want to sit down and find a way to complete the governor's agenda." Yet he still had some harsh words for Straus on Tuesday, especially when it came to one of Patrick's biggest priorities: a "bathroom bill" that would regulate which restroom transgender Texans can use. Straus opposes such legislation, which has not yet received a committee hearing in the House. "Right now, if that bill fails," Patrick said, "he alone will have killed it."